The Mary Kay Insulated Color Case includes two color trays and one pencil tray making it a snap to store and organize your Mary Kay Cheek and Eye Colors, Lip Liners, Eyeliners, and Brow Definer Pencils. 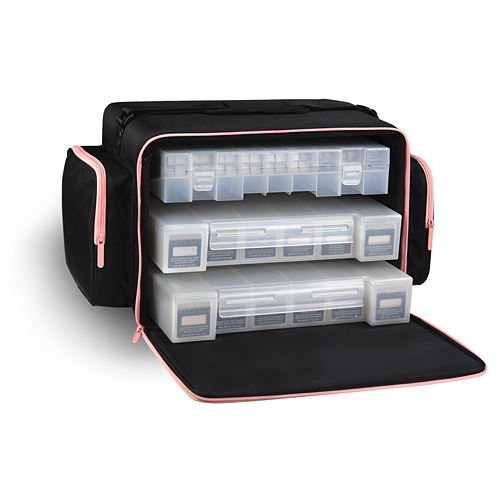 Built in shelves support each tray, and side pockets hold mascaras or other items. Carry and lift with ease using the handy shoulder strap. This case has a 30-day 100% satisfaction guarantee and one-year manufacturer's warranty on defects. Exterior zippered pockets hold your mascaras and Compact Pros. Pencil tray stores 72 Mary Kay Lip Liners, Eyeliners, or Brow Pencils. Color Trays can be customized to hold Eye Colors, Cheek Colors, Bronzers, Highlighters, Pressed Powders, and Creme-to-Powder Foundations. Size: 10" x 15" x 13"